Melbourne University Athletics Club returned to the Meadowglen International Athletics Stadium on Saturday, the 21st of November for Round 6 of the AV Shield Competition and came away with a swag of wins, good performances and high hopes for the second half of the season. As is tradition, Paul Kennedy led off the program winning the 2000m, his sixth win from six starts this year. The indefatigable Kennedy looks unbeatable this season although Tom Kennedy was heard insisting ‘Mum is faster’. Lauren Jauncey, another MUAC athlete in top form, collected her third win in three rounds with a fine performance in the 100m, as well as third in the 400m. 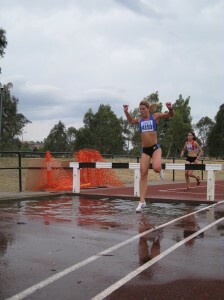 Kath Clarke roared back from exam study to win the 400m. Jacquie Sharples stepped over the barriers with ease to win the 100m hurdles, one of five events the Summer Team Captain took on in Round 6. 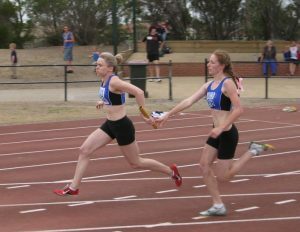 The Women’s 4x100m relay team flew around the oval for a convincing win, well in front of all their competitors. Anthony Hanna, Irie Hill and Evelyn Burry racked up wins for the club in Pole Vault, as the vaulting saw a slew of personal bests. 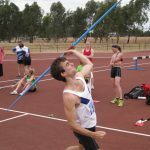 MUAC athletes also dived willingly into unfamiliar events with a large contingent throwing the javelin and discus and giving the triple jump a hop, skip and jump (or fall as the case may be). Many extra points were garnered for the team through these sometimes comical efforts. 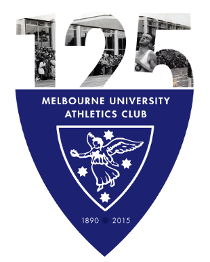 Vic Milers Club is on this Thursday, 26th of November. Friday Night Bowls is on this Friday, 27th of November. RSVP Now. Round 7 is at Willamstown, this Saturday the 28th of November.